"Sampath Speaking" - the thoughts of an Insurer from Thiruvallikkeni: 'Kiwi" - the bird, fruit, and Nation that cares for birds .... !! 'Kiwi" - the bird, fruit, and Nation that cares for birds .... !! ……….. sure you would have see this fruit in supermarkets and perhaps would have tasted it also… it is the ‘kiwifruit’ the edible berry of a woodyvine in the genus Actinidia. Some articles suggest that this fruit helps preventing asthma, obesity, colon cancer, heart disease and protect our DNA from mutations. Reportedly, kiwi fruit contain more vitamin C than oranges, as much potassium as bananas and high amounts of beta carotene. Kiwi fruit is high in fiber which aids in controlling blood sugar levels and lowering cholesterol. While diabetics commonly believe that they should stay away from eating fruits – some suggest that they can take a variety of fruits – however they have to be careful of the fruit, the quantity and the diet pattern – they take. Kiwi is the name of the flightless birds endemic to New Zealand. At around the size of a domestic chicken, kiwi are by far the smallest living ratites and lay the largest egg in relation to their body size of any species of bird in the world. The kiwi is a national symbol of New Zealand, and the association is so strong that the term Kiwi is used in some parts of the world as the colloquial demonym for New Zealanders. 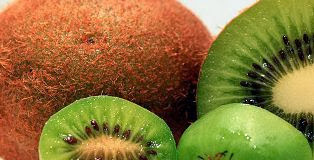 Kiwi is also the nickname used internationally for people from New Zealand, derived from the bird. The Kiwiland appears to be a very caring land…… years back, the whole Nation was so moved by the plight of a bird [is it really one !] - millions followed it online; So much was invested on it. It was fitted with a Sirtrack KiwiSat 202 Satellite Transmitter which was to transmit signals to satellites twice a day for three hours. That was for monitoring its position as it travels. Each new position was being plotted on the map and progress was being followed. Though the path could not be guided, its going towards the right destination brought cheers to those following it. The previous para was all about the Emperor Penguin named ‘Happy Feet’ whose fortunes and path were so much followed fascinatingly treating it to be a rare opportunity to learn about the movements of an amazing animal. Penguins are aquatic, flightless birds living almost exclusively in the southern hemisphere, especially in Antarctica. They spend about half of their lives on land and half in the oceans. This, Happy Feet was a wayward emperor penguin, discovered on a New Zealand beach ….a little later, it was moved to Wellington Zoo after becoming ill from eating sand, which he likely mistook for snow. He was administered intravenous drip and upon gaining weight, given a clean bill of health to return to the ocean. His unusual journey captured worldwide interest, with local TV3 station setting up a webcam in his small, ice-filled room at the zoo. An adult kiwi is battling for its life after being savaged by a dog - sparking a plea for dog owners to keep their canines away from areas with the endangered birds. The kiwi, nicknamed Jo, was attacked by a small fox terrier that was tagging along on a day-time hunting expedition in native forest south of Coromandel town. It suffered bite and puncture wounds, as well as severe bruising. 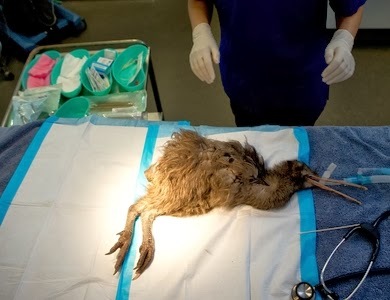 A hunter took the wounded bird to a vet in Coromandel, where it was driven to the Department of Conservation (DOC) office in Thames, and then on to Auckland Zoo. An Pas, a vet at the zoo, said Jo was stable but its future remained uncertain. 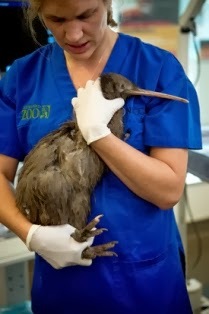 Thames-based DOC ranger Christine Friis said the attack showed that a dog of any size could potentially kill kiwi, and dogs were the biggest killer of adult kiwi. The conservation office stated that howsoever well behaved and docile the dogs could be, they could get attracted to the smell of a kiwi and in seconds could grab and kill it. They were arranging to provide free kiwi aversion training on the Coromandel over the holidays. The web is replete with appeals to dog owners to keep their dogs out of areas where kiwis live and if that is not possible, to ensure that dog is on a leash in those regions. Returning back to Emperor penguins, immortalised in the animated film Happy Feet ~ a new research states that they huddle to keep warm, like cars in a traffic jam. The penguins use stop-and-go movements to protect them from the harsh Antarctic winter the study has shown. An individual penguin only needs to move 2cm in any direction for its huddling neighbour to react and also perform a step to stay close to it. These movements then flow through the entire huddle of thousands of penguins like a travelling wave. This stop-and go motion plays a vital role in keeping the huddle as dense as possible to protect the penguins from the cold. Unlike a traffic jam, the researchers found that the waves of movements in a penguin huddle can originate from any single penguin and can move in any direction as soon as a sufficient gap, known as a “threshold distance”, develops between two penguins. Unlike other species of penguin, the male emperors are solely responsible for incubating their single egg during the winter, covering it in an abdominal pouch above their feet while the female returns to sea to feed. Well, if you still care to know what happened to that wayward Happy Feet – the costly effort and money spent in ensuring the return of the penguin came to ‘nought’ as the device stopped working shortly on the penguin’s return. 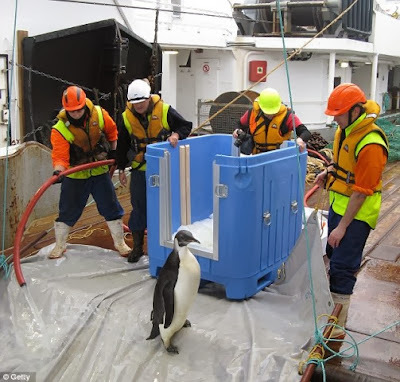 Experts felt that possibly the device could have fallen apart and reached the bottom of the ocean ~ even as Happy Feet continued safely on its journey or could have met its fate in the jaws of a larger creature.